The genetic code was deciphered in 1965, and was believed to be universal in all extant organisms on earth (the universal genetic code). However, in 1977, Barrell et al. reported that in bovine mitochondria UGA termination codon was used as tryptophan. Since then, several genetic code variations have been found not only in animal mitochondria but also in bacteria, yeast, ciliates and green algae. Therefore, the genetic code is not universal. “Codon capture” theory proposed by Osawa and Jukes is useful to explain how the genetic code variations have emerged during the course of evolution in these organisms. In the case of animal mitochondria, genome shortening effect should also be taken into consideration. Dr. Watanabe finds several genetic code variations and modified nucleosides at the anticodon first (wobble) and second positions of tRNA deciphering the varied codons in mitochondria of various animal species. He reveals the codon-anticodon pairing rule including the modified nucleosides and expands the “wobble rule” proposed by Crick, which gives a unified interpretation as for how genetic code variations have occurred in animal mitochondria. 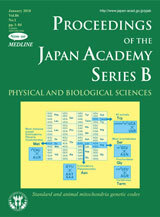 Dr. Watanabe reviews his marvelous findings in this issue (pages 11 to 39). 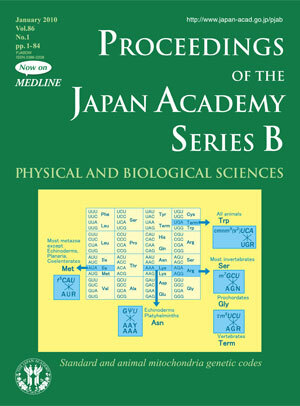 The cover illustration indicates the standard genetic code table in the box, and genetic code variations in animal mitochondria outside the box. The codon-anticodon base-pairing rules between the anticodon triplet (italic) of tRNA and codon triplet of mRNA are shown. (N: U, C, A or G; Y: U or C; R: A or G).